Q: How many systems come with CD or DVD drives these days? 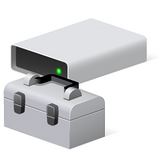 If you need to create a bootable USB drive, Diskpart can get the job done for you. You can then dump whatever it is you need to run onto the remainder of the free space. Type active + enter, then exit.